Most of the time you'd be lucky to glimpse one supercar on the road, but an exclusive motoring event in Leicestershire last weekend brought no less than 200 of the world's rarest and fastest vehicles together for charity. Called the Secret Supercar Meet, the invite-only event, which is now in its fifth year, saw an eclectic collection of exotic metal gather at Bruntingthorpe Aerodrome, despite the pouring rain making driving conditions less than ideal. With a combined value of over £20 million, the crowd of performance cars featured a number of rare gems, including a Mercedes 300SL AMG built for the Sultan of Brunei, a Pagani Zonda and a Ford GT 720 Mirage, one of only three in existence. Businessman Paul Bailey – who was the first man to acquire the 'holy trinity' of hybrid hypercars, the Ferrari LaFerrari, McLaren P1 and Porsche 918 – was also in attendance, with all three of his cutting-edge machines. The meet, which was organised by sports car owners club Supercar Driver, raised around £5,000 for the Bluebell Wood Children's Hospice in Sheffield. Event organiser Adam Thorby, owner of Supercar Driver, said: "The turnout from members was staggering considering the forecast which was heavy rain all day. "You would be lucky to see any one of those cars out in the height of summer, let alone the full group in less than ideal conditions. "It is testament to our members who had committed to the event and have bought their cars to use them, whatever the weather." He added: "The photoshoot on the runway was evidence of typical British weather, however it didn't put off these brave souls who were patient while we arranged the cars and jets. "We are delighted with how the event has been received and I'm already underway planning the 2016 event - watch this space." Check out the full collection of images from the event below. 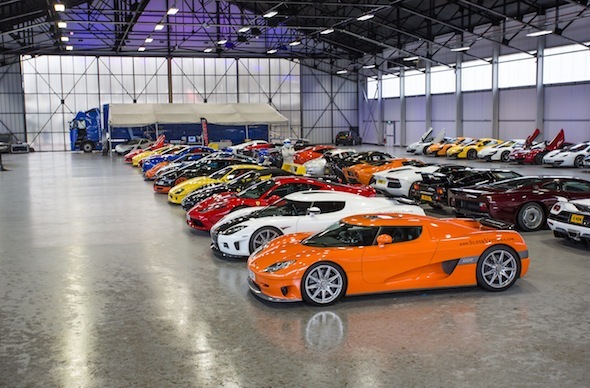 How many of the supercars can you name?